When SQL Server needs to create or expand a data file (AUTOGROWTH, or CREATE, RESTORE, or ALTER DATABASE commands) it needs to write zeros to the entire contents of the file (or the portion of the file that has been expanded) before it can perform any IO to that file. If you change the default AUTOGROWTH size (and you should change the default to prevent heavily fragmented data or log files), SQL Server will then need to initialize all of the freshly allocated space before performing additional IO to that data file. If you see a lot of ASYNC_IO_COMPLETION waits when you start to restore a database, you're waiting for SQL Server to write out the file to disk. SQL Server best practice is to run the SQL Server service as a user that does not have full rights to the server that it is running on. However, if this restricted user does not have the appropriate rights, you can't take advantage of instant file initialization when creating, restoring, or expanding database data files. Instant file initialization allows SQL Server to immediately start writing data to a file without having to write out the entire file. This dramatically speeds database creation, restore and expansion processes by nearly eliminating the ASYNC_IO_COMPLETION waits (there is still a negligible amount of wait incurred while writing to the file allocation table, which typically takes mere milliseconds). The user that the SQL Server service is running as need only one parameter changed in Group Policy Editor. Type in the name of the account (you may need to click the Locations... button to select the correct source domain/server). You will need to restart the SQL Server service to get it to recognize this change. Once this has been enabled, your database creation, restoration, and expansion processes will no longer occur an IO penalty for just writing out the data file. Note: This only affects the data files, log files still need to be full written to disk. I've run across this many times with multiple clients as they are locking down user permissions. It is very easy to overlook if you don't know about it. I recently ran across an issue where the Distribution database on the Distributor was almost 150 GB, but when I looked at the Publications in Replication Monitor, I found that there were less than 50,000 commands in queue across all Publications. I immediately thought, "Why on earth is the Distribution database bigger than this truck?" We also observed a lot of Disk IO on the Distributor, and the Distribution clean up: distribution job was taking a lot longer than normal (1-4 hours instead of 2-5 minutes). After some Googling I found a great article by Paul Ibison (http://www.replicationanswers.com/TransactionalOptimisation.asp) that reveals that the immediate_sync option causes the Distributor to queue all Transactions for a Publication until the retention period is reached, regardless of whether or not the Transaction has been delivered or not. This revealed 2 Snapshot Publications that had that option enabled. 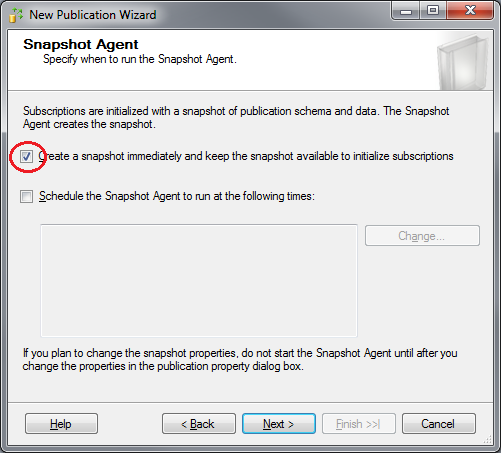 Yes, you read that correctly, the immediate_sync option also causes the Distributor to queue all Transactions for Snapshot Publications. Even though they're not necessary for the Publication. The next execution of the Distribution clean up: distribution job will take much longer, but it will then clean up all the unnecessary transactions. In my case, there is now less than 10 GB of data in the Distribution database. These scripts can be executed on the fly without impact as they do not interrupt or affect the Publication (aside from telling the Distributor that it no longer needs to queue commands that it doesn't really need). This option can greatly impact the performance and storage of your Distributor. If you suspect this an issue on a Distributor you manage, I recommend you run the scripts above to check for and correct the issue. Thanks again Paul Ibison for your invaluable assistance. When I attended Red Gate's SQL In The City in Charlotte, I spent a great deal of time chatting with the SQL Monitor project manager, Daniel Röthig. He let me in on a little secret about SQL Monitor v4 that really excited me. It's no longer a secret and I recently upgraded from SQL Monitor v3 to v4. Overall, I was very happy with the upgrade process and the new features. The upgrade to v4 was very straightforward. While it didn't initially give any initial indication that it had discovered that v3 was installed, it did carry over all of my settings and at the end of the process it warned that a downgrade was not possible due to the changes that the upgrade made to the structure of the repository database. The upgrade was quick and painless. My only wish here would be for it to check (or indicate) that it found another version already installed. This would improve confidence level through the install process (I ended up going back and forth a couple times between the install and the current version to verify folder path and configured ports). Within moments of launching the new version, I immediately noticed two new features. When you select an instance of SQL, SQL Monitor v4 only lists the first 5 databases on that server. I have several servers with 500-2000 databases and by the time SQL Monitor v3 listed them all, it's time to refresh the page (making the SQL Instance page nearly useless as it was constantly refreshing/loading). This feature greatly improves loading speed of the main page for SQL Instance monitoring. The issue still exists if you expand all the DBs on the server, but you can just click the Pause button (or rewind time 1 minute) to suspend the page refreshes. Once you've drilled into the specific database you're interested in, you can click the Return to present button to resume real-time monitoring (and page refreshes). Top 10 SQL Server wait stats (sorted by Wait time, Waiting tasks, Average Wait time, or Signal wait time) with a brief description of each wait state. This is the best new feature of SQL Monitor v4, and this is what Daniel and I spent so much time discussing. Just knowing the query resource utilization only reveals part of the story. By monitoring the wait stats, you can better focus your tuning efforts and have a much clearer understanding of what SQL Server is doing. Deadlocks appear here and you can drill into the detail of the deadlock participants. You can currently view charts for server resource utilization (OS and SQL resources) with baselines on the Analysis tab, but charts for wait types and query waits/resources would also be beneficial. Charts should be clickable to drill into detail for a specific wait type, resource, or query. Charts help to reveal queries that are more bursty in nature. I would be more likely to tune a poorly performing query that completely pegs system resources for a couple minutes than one that consumes the same amount of resources over a larger timeframe. Page Life Expectancy only reveals so much information and it's value decreases greatly when running on multiple NUMA nodes (PLE is an average across all NUMA nodes. If one NUMA node is crushed, but the others are fine, PLE will not reveal the a true measure of memory pressure). These stats are additional ways to measure memory utilization/pressure on an instance of SQL. In conclusion, SQL Monitor is maturing into a robust product and the v4 upgrade brings it one step closer to being the best SQL monitoring tool on the planet. Recently, I was working on load-balancing multiple replication Publications across two Distributors. I had dropped the Publications and Subscriptions on one Publisher that was being migrated, and then registered the Publisher with a newer Distributor that had less load. I was able to recreate the Publications and Subscriptions without issue and they appeared properly in SQL Server Management Studio. However, none of the Publications appeared in Replication Monitor giving the impression that nothing was happening. The Snapshot Agents did appear in Replication Monitor and I was able to successfully generate snapshots, but other than that, I was flying blind. We ended up rolling back to the old, overloaded distributor until we could determine the issue. Initially, I assumed it was something with the Publisher I was migrating as other Publications on other Publishers were working properly. However, it worked perfectly with the old Distributor before the migration and after rolling it back, so the root cause was initially a mystery. When I discussed the issue with another DBA, I found out that this has been an occasional problem with any new Publishers/Publications using the newer Distributor. We then changed our focus to the Distributor and found that the newer Distributor server was experiencing CPU contention. We knew that there was some CPU contention, but we thought it was minor as average CPU utilization was only 50%. After finding an excerpt from the excellent Red-Gate book Performance Tuning with SQL Server Dynamic Management Views, we were able to find that the signal waits time percentage was pretty high (~25%), clearly indicating that our CPU contention was a greater issue than we originally thought. Ideally, this percentage should be less than 10-15%. If you're pushing over 20% like we were, you've got CPU contention issues. We were able to add additional CPUs to the newer distributor and our signal wait time percentage dropped to about 8% and all issues with Replication Monitor are now a thing of the past. Many thanks to Glenn Berry, Louis Davidson, and Tim Ford for your contributions to this fantastic book and to Red-Gate for publishing it.